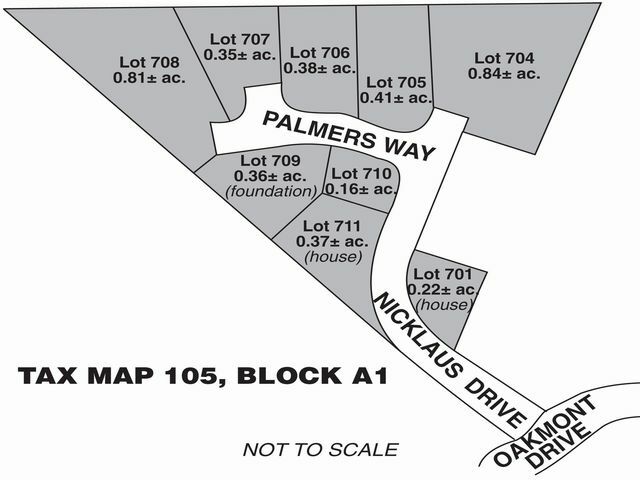 Property is comprised of 9 lots in the 10-lot Hole 16 Subdivision situated in the exclusive Legends at Dunegrass Community, close to golf and the Atlantic Ocean  2 lots (1 & 2 Nicklaus Drive) are improved with newly built 3-bedroom homes; 1 lot (4 Palmers Way) has a foundation; and the 6 remaining lots (7 Nicklaus Drive & 1, 2, 3, 5 & 7 Palmers Way) are cleared lots ready for build-out  Lots range in size from 0.84± acre to 0.16± acre  PMUD Zoning District  Underground utilities in place, public water & sewer available  Tax Map 105, Block A1, Lots 701 & 704 thru 711. Total assessed value: $1,598,300. FY 2018-2019 taxes: $24,454. Mortgage Ref: York County Registry of Deeds Book 16698, Page 834. Sale per order of Mortgagee by its Attorneys: Alexander S. Buchanan, PLLC, Nashua, NH; by Alexander S. Buchanan, Esquire. Terms: $10,000 deposit by cash, certified check, bank check, or other form of payment acceptable to Mortgagee at time of sale, balance due within 30 days. Other terms may be announced at time of sale. All information herein is believed but not warranted to be correct. The Mortgagee does not warrant the condition or existence of any feature described above. Full Description: Property is comprised of 9 lots in the 10-lot Hole 16 Subdivision situated in the exclusive Legends at Dunegrass Community, close to golf and the Atlantic Ocean  2 lots (1 & 2 Nicklaus Drive) are improved with newly built 3-bedroom homes; 1 lot (4 Palmers Way) has a foundation; and the 6 remaining lots (7 Nicklaus Drive & 1, 2, 3, 5 & 7 Palmers Way) are cleared lots ready for build-out  Lots range in size from 0.84± acre to 0.16± acre  PMUD Zoning District  Underground utilities in place, public water & sewer available  Tax Map 105, Block A1, Lots 701 & 704 thru 711. Total assessed value: $1,598,300. FY 2018-2019 taxes: $24,454. Mortgage Ref: York County Registry of Deeds Book 16698, Page 834. Sale per order of Mortgagee by its Attorneys: Alexander S. Buchanan, PLLC, Nashua, NH; by Alexander S. Buchanan, Esquire. Terms: $10,000 deposit by cash, certified check, bank check, or other form of payment acceptable to Mortgagee at time of sale, balance due within 30 days. Other terms may be announced at time of sale. All information herein is believed but not warranted to be correct. The Mortgagee does not warrant the condition or existence of any feature described above.